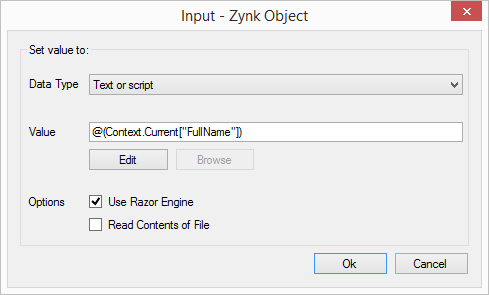 This article will step you through how to use the four tasks in the User Interface folder in the Zynk Task Library. Please note, these tasks are generally used for debugging purposes and should not be used when running a scheduled task. This example will show you running an export from Sage 50 and displaying the result. The Display Last Output task will open the file exported from Sage 50 for you to peruse. As you can see, I have set up a workflow to run an Export Currencies task from Sage 50 and a Display Last Output task. Make sure the Input on the Display Last Out task is specified to (Output from previous task). Running this will open the Output File from your Export Currencies task in your default text editor. 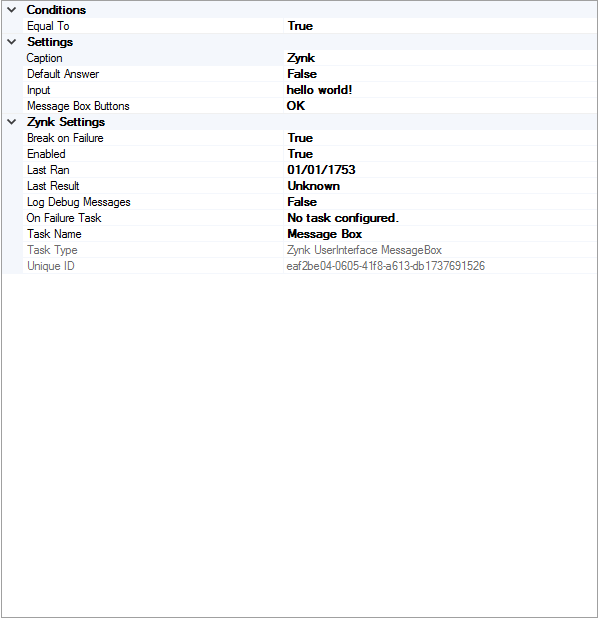 In this example, I will use the Input Box task to log a message in the Zynk Info tab using the Log Info Message task. Firstly, configure your workflow to have an Input Box task and a Log Info Message task. Then, run the workflow and a Zynk Object dialogue should appear, as shown below. As you can see, I am going to echo the words ‘hello world!’ in my Log Info Message task. The results are shown below. I’m going to use my Log Info Message task to write out the name of these three files, and this will confirm I’m looping over the right directory. Firstly, I’m going to next my Log Info Message task underneath my File Repeater. You can do this drag and dropping the Log Info Message Task on to the File Repeater. Then, I am going to configure my Log Info Message settings to write out the current file name using context variables. More information can be found on our File Repeater article. Finally, when I run my workflow the Log Info Message confirms I am looking at the correct directory. 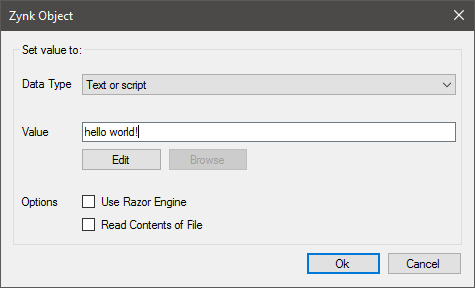 For this example, I will use a Message Box to echo the words ‘hello world!’. Finally, when I run my workflow the following Message Box is displayed.